So all you do is choose the phrase you want, enter it into the message box and update the amount of items to equal however many letters you are needing for your phrase. Example: If you want "HELLO" written, that will be 5 letters! Then choose if you want black or white, medium or large letters and you're all set! Item: LARGE vintage hanging metal letters in Black or White - Measures 3.25" tall. * Please note that letter "E" is no longer available in the black large letters. 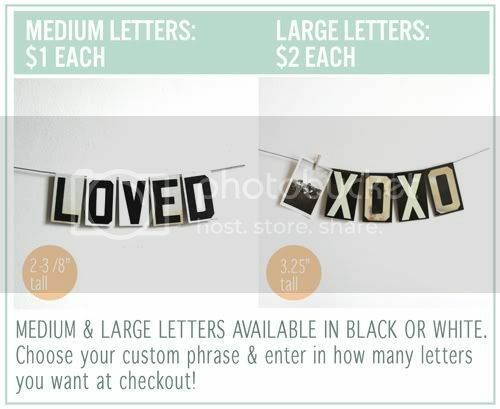 Item: MEDIUM vintage hanging metal letters in Black or White - Measures 2-3/8" tall. - This deal is open to all countries, shipping is only $2.50! Shipping cost will be added in at checkout. - This deal is open until Sunday, March 20th or until items are sold out. 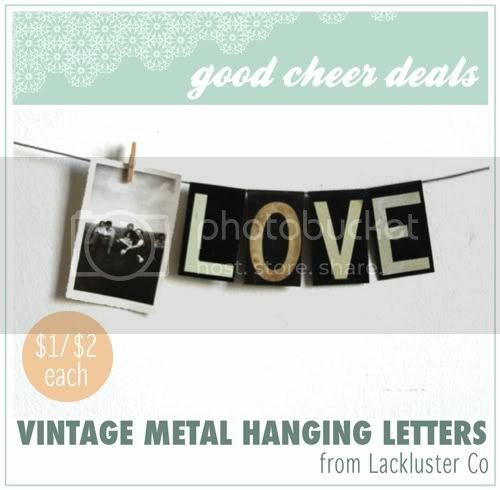 - Please be sure to visit Lackluster Co and support! v cute! i really like how industrial these look. xoxo jcd :: stop by cornflake dreams to enter a personalized print giveaway !! Wow these letters are so cute! Thanks for sharing. :) I love your blog by the way. I LOVE these letters - so perfect - thank you!!! I just had a question... I ordered for a word but only got charged for one letter? I don't know if there's a glitch? I just hope I don't only end up with one random letter! But I thought you might want to check it out in case there is a glitch. I too, couldn't figure out how to change the quantity of my order and only got charged for one letter. BUT I am super excited; fun giveaway, thanks! The paypal button code was not correct - Beth from Lackluster Co will be messaging you to correct the qty issue. To everyone else: The button is now working! Thanks for your understanding. Love this paired with the black and white prints... Brilliant. I just finalized the order! I want to share about them but I think I'll be giving them to my husband for our anniversary (I selected our initials) so I'll have to keep it quiet for the moment...I love this deal! I am still getting the 1 letter only charge from paypal. Anyone else? Oh, wait! Duh. I figured it out! I see the update total option now. Ordered! These Good Cheer deals are all so dangerous for me!! I can't wait to get my letters in the mail.